The Lateral Loan program, launched on May 1, 2018, is part of the Lead Line Replacement Assistance Program. It was created to help those Halifax Water customers who need to replace their private lateral but cannot afford or cannot secure a loan with their banking institution to pay for the replacement. The Lateral Loan can also be used for lead service line replacements. Willing to accept a lien on the property to secure the loan. There is no credit check required to get approval for a Lateral Loan. An inability to obtain funding or financing could be due to a low credit rating, an existing loan that limits the customer's ability to borrow more from their bank, or insufficient savings to fund the replacement of a private lateral. What is a Private Lateral? A private lateral is the section of a service connection on private property that connects the plumbing in a property owner's home to the water, wastewater, or stormwater mains in the street. Diagram showing the division of responsibility based on the property line. Why Replace a Private Lateral? 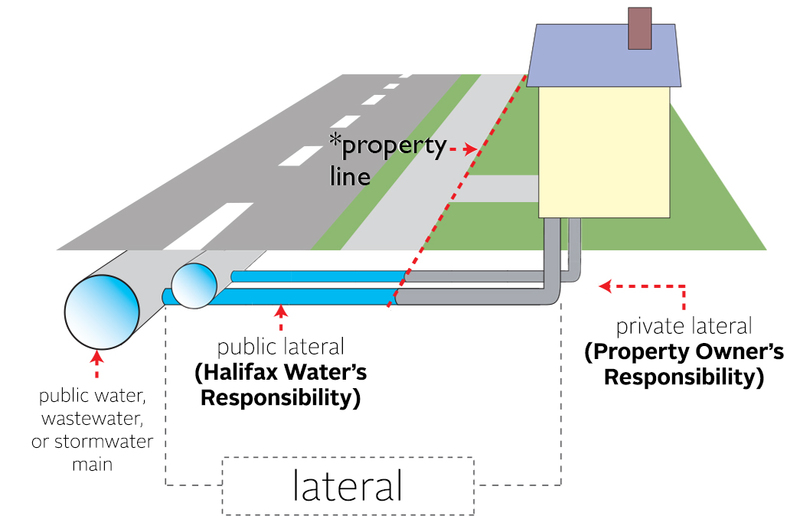 While the private lateral is the responsibility of the homeowner, when any of the issues listed above become known on the public lateral, the section which is owned and maintained by Halifax Water, one of three contractors approved to complete this type of work, will replace the section of the public lateral on behalf of Halifax Water. The maximum value of The Lateral Loan is $10,000 (less the total of any Halifax Water rebates for a lead lateral replacement). The final price of the replacement determines the total loan amount but is preapproved based on the quote from the selected contractor. There is no credit check; all Halifax Water customers are eligible for these loans as long as they are the registered property owner and are willing to accept a lien on the property as security. Those property owners who have a lead lateral and are replacing it are eligible for a rebate of 25% (up to $2500) of the costs of the replacement through the Lead Line Rebate program. If a property owner takes advantage of the rebate, the total amount of that rebate will be deducted from the $10,000 loan maximum, reducing the amount that can be borrowed by the amount rebated back to the property owner. For example, if a lead lateral replacement cost $10,000, the rebate would be 25% of $10,000, which is $2500. Therefore, the loan maximum would now be $7500 ($10,000-$2500 = $7500). The maximum term of The Lateral Loan is five years (60 months); however, the property owner may choose a shorter term on The Lateral Loan Application Form [PDF]. The term options are 12 months, 24 months, 36 months, 48 months, and 60 months. There is no penalty for making early payments, or for paying off the entire loan early. The Lateral Loan has an interest rate of Prime plus 2%. The Prime Interest Rate in Canada as of January 2018 is 3.45%; therefore, the interest rate for The Lateral Loan is 5.45%. Step 2: Complete The Lateral Loan Application Form [PDF] and submit it to Halifax Water, along with a copy of the quote from the chosen contractor. Step 3: Upon approval by Halifax Water, the property owner will ask the contractor to proceed with the private lateral replacement. The contractor will then submit the construction permit to Halifax Water. Step 4: The contractor completes the replacement of the private lateral. If the chosen contractor is on the list of pre-approved public lateral replacement contractors, the public side of the replacement will also be completed by that contractor on behalf of Halifax Water to reduce construction time near the property. Step 5: The contractor then contacts Halifax Water to have an inspection completed on the new lateral(s). Any deficiencies must be corrected. Step 6: Once the Halifax Water Inspector has approved the work, the contractor will address a final invoice to Halifax Water and send it to the property owner. If applying for the Lead Line rebate, submit that application at this step, as well. Step 8: Payment is made by Halifax Water directly to the contractor for the amount shown on the final invoice. When the payment is made to the contractor, a lien is placed on the property for the amount paid to secure the loan. Step 9: The property owner then begins making regular monthly payments on the loan until the loan is paid in full, at which point the lien on the property is removed. There are no penalties for paying off the loan off early. Loan payments are separate from the Halifax Water Bill. Not all applicants will be approved.